Not sure of the problem with your iPhone 5S - book it in for an inspection and send it in for us to diagnose. Our engineers will check your handset and send you a quote via email. This repair is for an iPhone 5S bottom dock connector replacement. Please select this repair if your iPhone 5 is no longer syncing or charging via the USB cable. 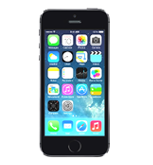 This repair is for the cleaning of liquid damage on your iPhone 5S - It covers the cleaning of the mainboard and the replacement of damaged main board components.